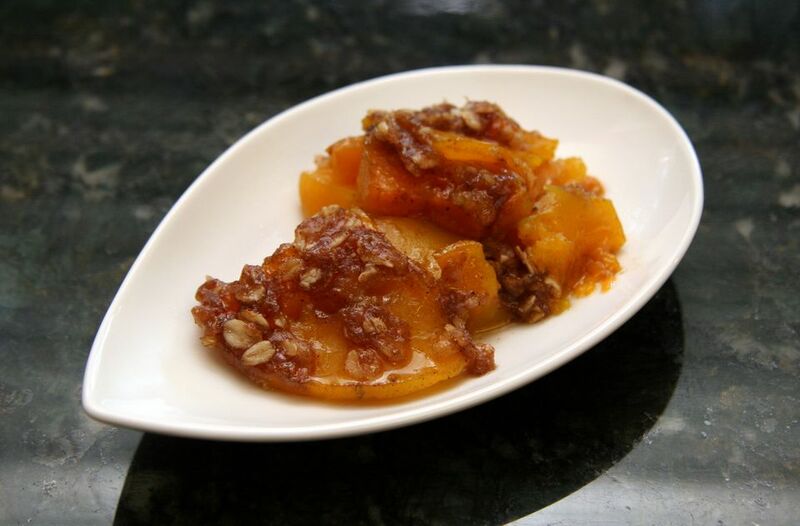 This flavorful butternut squash makes a great side dish for the holidays or serves the casserole along with any family meal. The brown sugar and cinnamon oat topping complement the squash perfectly. It is a fabulous side dish to serve with ham or roast pork. Winter squashes can be difficult to peel and cut, but I find a y-peeler makes peeling much easier. Use a large, sharp knife to cut, and make sure the squash is stable on the cutting board and won't roll when you begin to slice. Butter an 11-by-7-inch baking dish or shallow 2-quart casserole dish. Heat oven to 350°. Quarter the squash lengthwise and cut off ends.Peel it and scoop seeds out, scraping with a spoon to get the extra fibers. Slice thinly and put the slices in a large bowl. In a medium bowl, combine the brown sugar, cinnamon, nutmeg, and salt. Mix with a fork. Measure 3 tablespoons of the brown sugar and spice mixture and sprinkle over the squash slices; toss to coat. Turn the squash into the prepared baking dish. Into the remaining brown sugar mixture, add the flour and oats. Cut in the butter with a fork, fingers, or pastry blender until well combined. Sprinkle the crumb mixture over the squash. Cover tightly with foil and bake for 45 to 55 minutes, or until the squash is fork tender. Remove the foil and bake for about 10 minutes longer.